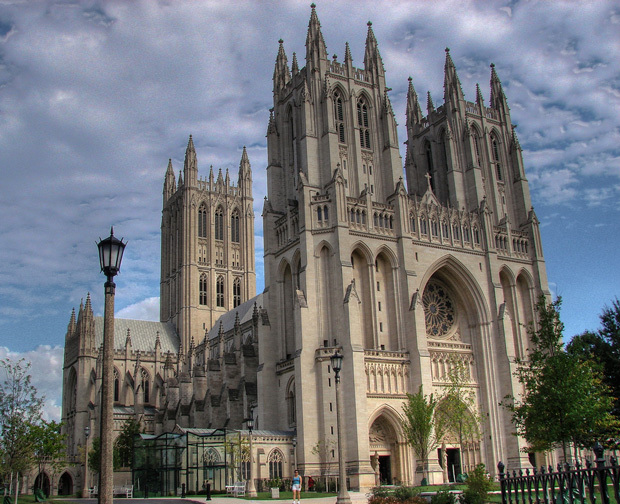 This Friday, the Washington National Cathedral will be filled with the sounds of Muslim prayers. Muslims and people of other religious traditions have participated in Christian or Interfaith services at the Cathedral in the past. However, the November 14 event marks the first time American Muslims have been invited to lead their own traditional Jummah prayer inside the same sacred space that has hosted presidential funerals and other national religious services. The idea for the service emerged from a conversation between Rasool and the Cathedral’s director of liturgy, Rev. Canon Gina Gilland Campbell. The two friends met while planning a memorial service for the late Nelson Mandela. The Jummah prayer is being held with the support of Muslim leaders from the the All Dulles Area Muslim Society (ADAMS), Masjid Muhammad (the Nation’s Mosque), the Council on American-Islamic Relations (CAIR), the Islamic Society of North America (ISNA), and the Muslim Public Affairs Council (MPAC). All of the above organizations are known to be part of the US Muslim Brotherhood. The Cathedral Church of Saint Peter and Saint Paul in the City and Diocese of Washington, operated as the Washington National Cathedral, is a cathedral of the Episcopal Church located in Washington, DC. The cathedral is the seat of both the Presiding Bishop of the Episcopal Church, Katharine Jefferts Schori, and the Bishop of the Diocese of Washington, Mariann Edgar Budde.